In a business environment buzzing with a constant stream of e-messaging, one way to demand the attention of your target audience is a good old-fashioned direct mail campaign. Learn how the authority and permanence of “print” might be just the hot new medium for your law firm’s business development plans. Direct mail has long been a key component of advertising and sales strategy for commercial companies and for professional service providers outside of the legal arena, but some law firms have been slow to grasp the proper use of this tool and to realize its full potential. For those who take the time to learn how it works, there will be a realization of why direct mail is more popular than ever in the corporate world. While companies have slashed marketing budgets and reigned in expenses during the past few years, they have continued to increase their use of direct mail. As a result, direct marketing now represents more than 50 percent of total ad expenditures, growing faster than ad spending in general, according to the Direct Marketing Association’s yearly report, "The Power of Direct Marketing" excerpted at About.com. The reason is simple — direct mail, when done properly, works. More than 75 percent of people say they are likely to look at direct mail — roughly three times as many as those who review all other ads, including unsolicited e-mail, Internet ads or sales calls to the home, according to the annual Vertis Customer Focus Survey at the Microsoft Small Business Center. Furthermore, direct mail is more likely to generate a response even from technology oriented 18 to 34-year-olds, based on a study of actual behaviors cited by Promo Magazine. "Direct mail is a form of advertising that can be aimed precisely at your targets, and it can create a favorable impression even when it does not generate a response," explains Rachel Hayes, senior director of communications and community engagement for Oxfam America and former vice president and principal consultant for Wellesley Hills Group, a management consulting, marketing and lead generation firm that serves professional service firms. Hayes notes that a good direct mail campaign can work especially well for lawyers when properly coupled with in-person seminars on particular areas of the law. "The top three ways in which buyers of professional services identify prospective providers are: referrals from colleagues; personal recognition of the provider; and in-person seminars," she explains, adding that direct mail is the leading way to attract seminar attendees who are prospects. "It can also work well for recruiting, charity events, and promotion of new web site content," she adds. While the words "direct mail" can conjure up images of junk mail for those who are unfamiliar with it, Hayes defines it very differently and succinctly. "It is an invitation to action — to purchase something, to enroll in something, or to participate in something — which uses print communications to a very targeted group of prospects," she explains, adding that the print communication by itself "can promote or advance your brand by offering an opportunity to attend an event or to learn something of value." She notes that law firms have used direct mailing not only to invite qualified targets to seminars or presentations that demonstrate expertise, but to get targets to download white papers, to come in for complimentary consultations or to obtain other branded items or information of value and interest. "The beauty of direct mailing is that the targets qualify themselves as interested simply by responding to the call to action," says Hayes. "If they show up at your seminar, or download your white paper, or do whatever you requested to obtain something of value to them, then you know they are invested," she adds. 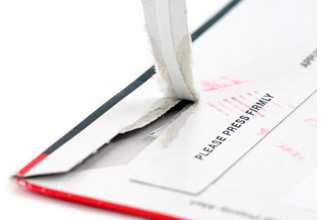 Just how targeted can you get in a direct mail campaign? Hayes suggests that a good direct mailing list can ensure delivery of your message to virtually of the prospects you want to meet. "You could deliver something to all of the HR executives at local companies, to all of the companies involved in litigation in certain jurisdictions, to every company that has filed for a patent in the last three years, to all of those targets in specific zip codes, or to just about any group you can imagine," she says. Direct mail has other benefits as well. "It can create the most memorable impressions of any kind of advertising when done well," Hayes asserts. She points, for example, to a famously successful campaign by a high-end health club designed for executives. "The club was able to learn the shoe sizes for targeted executives, and they sent each of them just one athletic shoe. The executives then had to show up to claim the other shoe, and it was a huge success," Hayes says. Another campaign receiving awards from the American Printer involved a "Simpsons" movie promotion and certain 7-Eleven convenience stores which were temporarily transformed into branded "Kwik-E Marts." The point-of-purchase art, coupled with the cartoon family's strong fan base and promotional offers by the stores, delivered an incredible increase in customer visits. Hayes adds that a direct mail campaign can even deliver results when targets fail to answer the call to action. "At Wellesley Hills Group, we did our own direct mailer, and made a new connection with a nationwide law firm that was simply following up on an inquiry related to the mailer without actually answering the call to action," she explains. "That firm became a client and that one connection made the entire project worthwhile," she says. 1. Choose your objective, whether it is raising awareness of your firm, qualifying your lawyers as experts in a field, building trust, or providing a forum for closing sales. 2. Design your strategy and tactics to fit your objectives. If your law firm does work mostly for individuals (such as estate planning or personal injury litigation) then you need a business to consumer strategy (rather than B to B) and/or a strategy for reaching out to likely referral sources. 3. Design your mailings and the content in them so that your intended messages are clear, readable and uncluttered. Make it easy for people to answer the call to action, or to find an event, and avoid three-page registrations and big data collection forms. 4. Integrate your direct mail campaign with other marketing tactics as part of an overall strategy toward accomplishing your goal. Direct mail works best in conjunction with your other campaign tactics — such as social media, PR, advertising or branding campaigns — calling attention to them while calling targets to specific actions. 5. Get the right lists and work them regularly. By reaching out periodically to your targets, you will reinforce their awareness and you will be able to refine your list so that it casts just the right size net to catch the fish you want. But don’t make the net too tight, or you will let some prizes get away. "Direct marketing is all about the list, and to some extent how well you use it on a regular basis," says Hayes, who notes that Wellesley Hills Group has knowledge of and access to numerous lists as a result of their work. She points for one example to the availability of lists containing biographical and contact information for as many as 100,000 business executives. "If you want to mesh five lists, [a direct marketing firm] can tailor a solution to fit your needs and often can do it less expensively than you could on your own," she says. Hayes's former firm also leverages manpower by creating work groups that have developed a process for carrying out all kinds of campaigns repeatedly. "People who do this regularly can do it with less staff than law firms would assign to it," she says. "We also know how to reach out and touch people," Hayes says, noting that a productive direct mail campaign should yield a response rate of at least one to three percent. "If you can yield 20 qualified prospects from a mailing to 1,000 targets, that is a great return on objective," she says, adding that her firm’s direct mailing campaigns have frequently delivered five or more new connections per month that were excellent prospects to become new clients. But Hayes also has a candid word of caution to those who are thinking of stepping up to a serious direct mail campaign. "You have to know the budget and the energy you are willing to devote to this, and you have to be committed to the resulting growth. In the abstract, growth sounds great to a lot of people, but it will strain your resources if you are not planning for it. It is simply a waste of time if you are not committed." John O. Cunningham is a communications consultant, freelance writer and contributor to various legal and business publications. He practiced law for 16 years and served as general counsel for both Pizzeria UNO and Chief Auto Parts (later merged into “AutoZone”). Comments may be sent to him via e-mail at . For more information, please visit his web site. Since being interviewed for this article, Rachel Hayes has transitioned to the role of senior director of communications and community engagement for Oxfam America. In this role, she is responsible for the content of all direct mail used by this international relief and development organization including all fund raising solicitations and constituent calls to action. Oxfam America works to create lasting solutions to poverty, hunger and injustice. © 2010 John O. Cunningham. All rights reserved. Do not reproduce or disseminate without permission of the author. Click to see more law firm marketing articles. Publish your article on Legal Marketing Reader. Have you got a unique article idea? Send query to . © 2007-2015 Legal Marketing Reader.